Often we think of musicals deriving from books or plays, but now what was a Dreamworks Animation film has been brought to life in this fantastic, theatrical performance – and what a great performance it was! The audience were dazzled by Shrek’s ogre-like features, stunned by Fiona’s beauty, and continually humoured by Donkey’s remarks (not to mention the farting!) 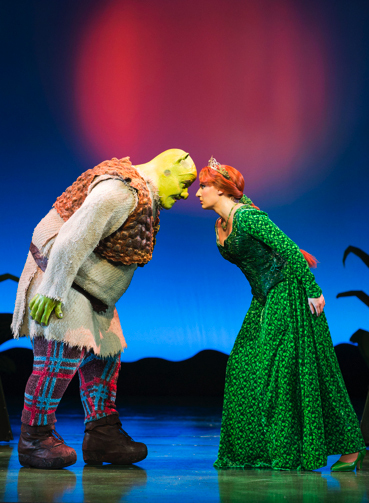 The viewers also learn secrets not previously revealed in the film, such as Shrek’s backstory and Fiona’s upbringing. Having said this, it still is similar to the film, so if you were a fan of the 2001 movie, you are sure to love this too. As one would hope from a musical, the music itself was fantastic; all the younger (and some of the older) members of the audience were very energetic when it came to dancing. It features brand new songs that tell the story of Shrek, Fiona and Donkey. A special mention to Dean Chisnall, who plays Shrek, for bringing the character to life; what a fantastic actor! It was also Lord Farquaad played by Gerard Carey who had the audience in fits of laughter. If I say `silly legs` you will understand! Costumes were similar to the film with great attention to detail. The staging was magical. The dragon had the children in the audience mesmerised as it was expertly manoeuvred round the stage by the crew. It definitely isn’t a musical to be missed. Adults and children will be delighted! Tickets are still available from atgtickets.com; the last performance is Sunday 6th September. Also look out for the new service at MK Theatre called Ordertorium Food whereby you can order from a small menu of icecreams, drinks and snacks delivered to your seat. You will certainly feel like a VIP!